Metal halide lights are strong performers for the vegetative growth phase, such as in young plants. They can be used through the entire cropping season for salad greens, herbs and root crops. Metal halide lights are the de-facto standard source of lighting for hydroponic crop production today. MH bulbs are most appropriate for vegetative growth, rather than blossoming, fruit set and fruit maturation. Nevertheless, since all plants fundamentally must continue at least some vegetative production throughout their lifespans, MH lamps are often the default lamp even when the plant needs slightly different lighting for optimal production. Why are MH lamps so favored? They offer several compelling advantages for commercial and high-efficiency production. First, they put out a tremendous amount of light per watt. Secondly, they put out enough light that they can be located will above the planting area, so that people have room to work and move around without hitting the lights. That is a distinct advantage over other forms of lighting, such as fluorescent tubes. Third, the bulb and ballast are often separate units, connected by a power cord of varying length. So the bulb assembly can be protected from water and impact while the ballast is safely out of the way. Fourth, the ballasts have a good long lifespan, so that as each MH bulb burns out, simply buy another bulb and you're good to go. Our ballasts are 20 years old and still working just fine, even though I expect there are more efficient units available now. With all those glowing advantages, no pun intended, why would anyone use anything else? The first most important reason would be that there comes a time when fruiting crops, such as peppers and tomatoes, need different wavelenths to optimize production. If you have a greenhouse full of mixed plants, and only 10% of them are fruiting at any given time, that's not a big deal. But if you have a 30x100 greenhouse full of 2000 tomato plants that are in full production, that different lighting source can make a big difference in production. Secondly, MH bulbs (like many HID systems) run pretty hot. The ballast itself warms up nicely and should be isolated from anything flammable. It doesn't get super-hot to the touch but I wouldn't want fabrics or papers near it. The bulb itself does get hot to the touch and throws out a lot of heat, so you cannot use it for close-in seedling growth without cooking the seedlings. Third, even a small 100w system can sometimes provide more light than you really need. For small plantings of seedlings, baby greens and sprouts, it might simply be more than you need but you still have to pay for all that light. In those instances, fluorescent fixtures or LED make more economic sense. Still, MH bulbs are the workhorse for hydroponic HID lighting, because they work so well for so many circumstances. If you have spindly plant growth in your growing area, or you otherwise suspect sub-optimal light is holding back your production, consider experimenting with a single MH fixture and see how well it works for you. You might be amazed at the increased production your plants give you from that one change. We have a small number of 400W ballasts which we use for MH bulbs at the start of the growing season, and high pressure sodium (HPS) bulbs during blossoming, fruit set and maturation. We have generally been happy with this arrangement, and plan to continue that arrangement in the future. We have also used straight metal halide for either mixed-crop growing or when growing vegetative crops such as lettuces and herbs. So far we've been generally pleased with the metal halide bulbs, and we like that we can set up one bulb in a central location, and be done. Compare that to needing multiple fluorescent tubes to obtain the same brightness, and the metal halide is an easy winner. The one downside is that the bulb is so bright, it casts harsh shadows anywhere a piece of equipment stands in the way. For instance, rack supports, basket hangars and irrigation equipment all throw intense shadow onto anything growing behind the object. A careful arrangement of the growing area will minimize that problem. We plan to continue using metal halide for the foreseeable future. When our ballasts finally burn out, which might be next year or next decade, we'll re-evaluate the lighting options available at that time and decide whether to replace our equipment. Metal halide lights are one of the most common types of lighting fixtures in use today within both conventional and hydroponic/aquaponic grower communities. Yet these fixtures are rarely available from more common lighting retailers such as big-box home improvement centers or local hardware stores. As a result, you will almost certainly have to work with a hydroponics equipment dealer or greenhouse equipment dealer. Most metropolitan areas will have at least one or two such equipment dealers, but they may very well only advertise to professional and commercial outlets and you may not even know they're there. A Google search for "HID lighting" plus your location will typically bring up those businesses which are in your area. Even if you don't have anyone in your immediate area, MH lights, reflectors and ballasts are commonly shipped from national suppliers to wherever they are needed. Shipping for the bulbs themselves will be low because they do not weigh much, but the ballasts will weight quite a bit more. Our MH ballasts are a good 30-50lbs each. They are older models so the new ones might weigh less, but be prepared to pay for that weight. The reflectors don't weigh a lot but they can be large. Ours collapse into a nearly flat profile for easy storage, but others are one-piece. That will add to the cost of shipping, so choose those reflectors carefully. 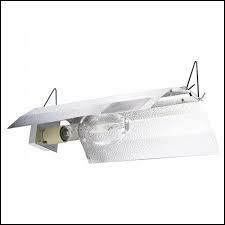 One interesting option is that some ballasts and some reflectors accept both metal halide and high pressure sodium bulbs. If a grower happens to be using both bulb types, that could help offset the overall shipping cost. When you have hydroponic questions, we have answers.